Fall 2017 brings up runway collections of clothes and university registration dates. Even though Fall is a time for school, it is not considered a reading time - summer 2017 brings up many best books to read. I wondered if we track humour, but find that trending jokes are not present on the internet. However, one retrieves most interesting things on queries such as this. Today's picture is the D&RGW 315 in a photo-op drive by. 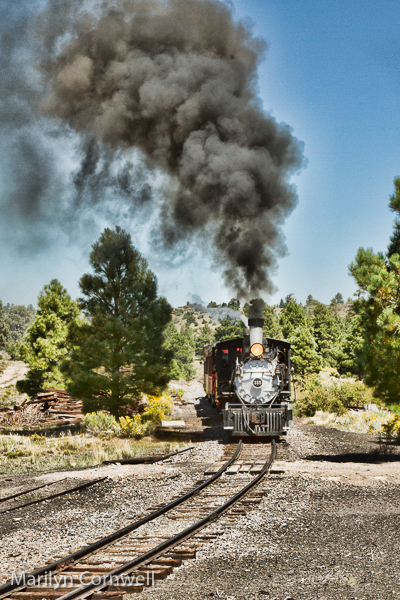 This is one of the Durango Railroad Historical Society's restoration projects and it has been operational since 2007. We had quite a few of these opportunities during our ride up in the mountains. The train would stop, and we'd disembark, then form a line of photographers. The train would back up and then come around a curve, etc. with all of us snapping away (or taking videos, so no talking).